_A Hindu festival celebrated every year in reverence of Lord Shiva. Shiva Ratri is spelled Maha Sivaratri,Shivaratri,Sivarathri,Shivaratra. (namely Milk, Buttermilk, Ghee, Honey, Sugar, and Fruits) while chanting Sri Rudram pleases Lord Shiva the most. Staying awake throughout the night (Jagarana) and worshipping Lord Shiva is particularly pleasing to Him. As per Sri Shankara Bhagavatpada, one has to worship Lord Shiva to achieve salvation and that too on Shiva Rathri day. It is certain that one who keeps awake on this day will attain Shiva Sayujyam (attainment of Lord Shiva). It is believed that the devotee’s sincere worship of Lord Shiva on this auspicious day/night will absolve past sins and enable salvation. According to a legend, Parvati performed tapas, prayed and meditated on this day to ward off any evil that might befall her husband Shiva on the moonless night. Since then, Mahashivaratri is believed to be an auspicious occasion for women to pray for the well-being of their husbands and sons. An unmarried woman prays for a husband like Shiva, who is considered to be the ideal husband.Another legend of the day is that Shiva and Shakti married each other. After creation was complete, Parvati asked Lord Shiva which devotees and rituals pleased him the most. The Lord replied that the 13th night of the new moon, during the month of Maagha, is his most favourite day. Parvati repeated these words to her friends, from whom the word spread over all creation. From the very early morning, Shiva temples are flocked by devotees, mostly women, who come to perform the traditional Shivalinga worship and hence hope for favours from the god. Devotees bathe at sunrise, preferably in the Ganga, or any otherholy water source (like the Shiva Sagartank at Khajurao). This is a purificatory rite, an important part of all Hindu festivals. Wearing a clean piece of clothing after the holy bath, worshippers carry pots of water to the temple to bathe the Shivalinga. They offer prayers to the sun, Vishnu and Shiva.Women pray for the well-being of their husbands and sons. An unmarried woman prays for a husband like Shiva, who is considered to be the ideal husband. The temple reverberates with the sound of bells and shouts of “Shankerji ki Jai” or 'Hail Shiva'. Devotees circumambulate the linga, three or seven times, and then pour water over it. Some also pour milk. Question: What is extraordinary about Mahashivaratri? Answer: Great spiritual vibrations surround this planet on Mahashivaratri night which occurrs only once a year. This is partly to do with the position of the planets that the Grace is so extremely powerful at this time. Because the Grace is so abundant and strong on this night, I urge you to stay awake and follow the traditional spiritual ways of fasting, praying, watching spiritual dramas and singing devotional songs on Shivaratri. It is really up to you to stay awake and take part in spiritual activities at this time. If you stay awake and sit in meditation or with the mind absorbed in Lord Shiva in some way, tremendous energies will work in your body. Keep your mind in your body and concentrate on spirituality. By doing this you will attain Shiva's great Grace and also the intense blessings of your spiritual master. The Grace of Shiva manifests in the forms of the Lingams that emerge from my body. Question: Why is it important to fast and stay awake? Answer: The body and mind will be purer and more receptive if you abstain from food. Fasting helps to cleanse the body. It detoxifies the body. A cleaner body means a clearer mind. In this way, we are more pure and ready to receive the great Grace of Shiva on Shivaratri night. It is this night that is very powerful so by staying awake the energy of Shivaratri will fill you. As the night goes on and you are chanting, singing and thinking of Shiva, the vibration will build up within you. Your ego reduces and automatically your spiritual realization increases. Question: What are the special qualities of Shiva? Answer: Shiva is total purity and perfection. Shiva has a number of forms but on Shivaratri we especially remember Shiva in the symbol of the Lingam. 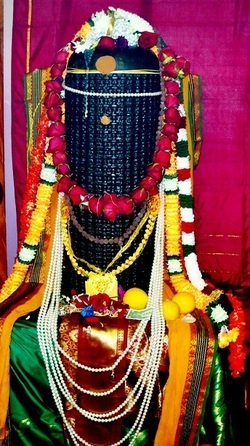 The Lingam form has amazing shakti (spiritual energy). The more we worship a Lingam, the more power it retains and radiates. On Shivaratri night we traditionally worship a Lingam four times through abishekam, pooja and offering. We can worhip Shiva in very simple way, even with leaves and water. He is pleased by simplicity and spirituality because of His yogic nature. He returns our simple offerings with Spiritual Grace. These great vibrations manifest within us as spiritual awareness and change of consciousness. Shiva's energy is made of absolute love and compassion. Shiva is the universal father who knows and sees all and exists in all life. That means that He is within you too. When we call out with longing from the bottom of our hearts He manifests strongly within us. Question: Why do you encourage us to chant the mantra Om Nama Shivaya at Shivaratri time? Answer: The greatest way to overcome the many difficulties and problems in life is through the grace of God. The best way to overcome obstacles on the spiritual path too, is Divine Grace. You cannot see the Grace. It is not material. It is spiritual. However, you can experience it within you. We can receive and retain this grace by remembering the name of God and surrendering ourselves to it. Great religions, in the tradition of Sanatana Dharma (the eternal and true path of life) focus strongly on the name of God. Divine words and names such as those chanted in mantras and sung in devotional songs can cure our diseases, remove doubts and wipe away difficulties. The name of God can solve your problem especially those related to your spiritual practices. It is has the power to give you a tremendous energy boost and help build a solid foundation for your practices. Do not doubt my words - this is my experience and also that of many who have reached the heights of spiritual attainment. That is one reason why I encourage you to perform and attend abishekams because you are chanting the names of the Divine with awareness and feeling. You are calling the highest powers of Divinity to be with you and enlighten you when you recite the mantras. The mantra Om Namah Shivaya is one of the most powerful mantras in existence. When you chant this mantra the grace of Shiva overwhelms you. To chant it on Shivaratri night means overpowering grace is absorbed by you that will boost you forward on the spiritual path. That's why I encourage everyone to celebrate Mahashivaratri in the traditional way. All the ancient saints and sages knew the value of Mahashivaratri and the power of the Shiva energy. I am continuing that tradition. Because our minds are alway distracted away from our spiritual path and our attachments in the world pollute our hearts we have a hard time to perform regular spiritual practices in our daily lives. That is why we do not see dramatic progress. When we use the Shivaratri night to the maximum it recharges our batteries. I like to say that such times are injections of spiritual vitamins for aspirants. Have patience and I assure you that success is certain if you continue your practices with regularity after receiving the Grace of Shiva on this great night. It is not only important to sustain your practice regularly but to do your daily practice with love and reverence. Don't allow your prayer or meditation or pooja to be mechanical but let it flow from the depths of your heart. Understand what disturbs and confuses your mind and causes your heart to be filled with impurities. If you look carefully, you will see that the causes are anger, hatred, jealousy, greed and attachment. Attachment means grasping, longing and wanting to own and possess, whether it be regarding a relationship of any kind, or material things. A person full of this pollution is like a lovely temple full of rubbish. Your heart is a divine temple so why are you daily turning it into a rubbish bucket? You forget that your heart is a temple. Invite the Grace and your spiritual teacher to live in your heart. Don't bury them in your mental rubbish. Clean it out and light it up with love and wisdom. After that any impurities will burn away in that great light. Remember, Shiva is the light of consciousness. The Shiva state is the state of Self-realization.